Solar-powered generators are a great replacement for traditional gas-powered models. These generators do not emit any noxious fumes and are virtually silent, which makes them perfect for indoor use. There is no flammable fuel to buy or store, creating safer operation and storing. They are portable, scalable, and require very little maintenance. And finally, the best part is that the energy is completely free and much better for the environment. Solar powered generators do come with a higher upfront cost, but they are worth the long-term investment. Purchase one here. Imagine hiking on a trail or strolling through a college campus while charging your cellphone or camera. 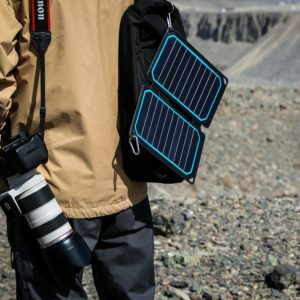 You can now take power anywhere with the OffGrid Solar Backpack that features a high-efficiency solar panel and USB battery pack. It charges smartphones, DSLR cameras and other USB devices. This backpack can increase the safety of your next adventure because you will never be without an electronic device in case an emergency arises. Buy one for your next trip here. This portable solar panel charger with USB port is a perfect way to charge your cellphone or electronic devices. This ultra-thin, water-resistant device is powered by high efficiency Mono-crystalline solar cells. It is perfect for camping and can clip right to your backpack. It has an auto-optimization feature that can recover lost power from shading. You no longer have to worry about your cell phone staying charged on your next trip with this device. Professor David Gordon Wilson from MIT has been working for years to develop the first solar powered grill. His recent piece about the progress of the grill explained that the solar cooker would be one that stores heat in a sealed container of melting salt for about six hours during a tropical day. At a chosen point, like when the salt is melted, the cooker is automatically fully insulated and can be used for cooking in the evening, three to five hours later. Professor Wilson is continuing to finalize this product. 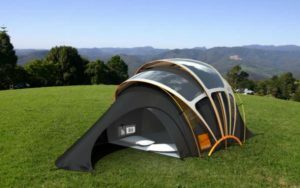 Solar panels on tents were a logical evolution from solar panels on homes. This is a revolutionary invention for campers who require some sort of power supply when camping. These tents have lights and even power outlets so you can charge your devices, like cell phones, tablets, cooking accessories, and more. Check out the 5-top-rated solar-powered tents on the market right now. One of the tents listed even comes equipped with LED lanterns, torches, and tent pegs. A solar powered laptop has not officially reached the market yet, but there are several portable laptop chargers out now which are worth looking at. These portable chargers have been around for a while and offer a great way to extend the battery life of your laptop while using renewable, clean energy. While laptops can’t run completely on a portable solar charger, batteries will run longer and laptops can be recharged when turned off. Check out a few charger options here. The first solar laptop could be here soon, though. Industrial Designer Andrea Ponti’s concept for the Luce Solar Panel Powered PC could become the greenest laptop ever made. The computer would have two solar panels, one on the back of the monitor and one underneath a touch keyboard. Ideally, the two panels would be able to power the computer continuously, though it has not determined if it has been successfully tested. While the solar laptop is still in the works, solar keyboards are ready for use now. 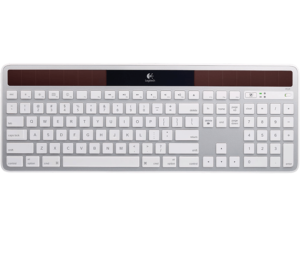 This wireless keyboard is slightly different than the previous items mentioned because it works indoors. Your desk is about to get sleeker thanks to this streamlined keyboard. This light-powered keyboard works where you do: your house, your office, or your hotel room. It charges itself with lamplight or sunlight, working indoors or out. Check out all the benefits this keyboard offers here. These gadgets are just the start of a greener lifestyle. Are you looking to take your commitment to the environment a step further?